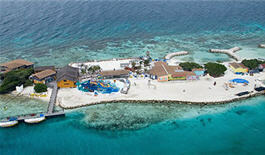 There are plenty of things to do in Aruba! So far, we've enjoyed snorkeling, rode on the bus to great beaches, and rented a jeep to discover the natural wonders of this Caribbean island. The island's tap water is pure and safe to drink and is distilled in the world's second largest saltwater desalination plant. Last time I was there, I got a map of Aruba to show you the lay of the land before you go. Ask for one at the information booth located at the pier. They are free. Since I was the one in charge of finding things to do in Aruba, I had already set my mind to take one of the "Jolly Pirates" daily tours... From what I read on the Cruise Critic forums, their tours are a blast! Their motto is: Sail, Snorkel, Swim and Swing. Ok so next time, I want to try the swinging rope... hmm wonder if they have an age limit? 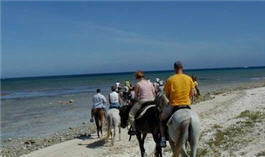 I don't like horseback riding but I know lots of people do, especially when they have a chance to do it on a beach. When we drove around Aruba, we saw plenty of groups on their ATVs (= all terrain vehicle), also known as quads. Quads are a fun way to explore Aruba. It is flat and along the Eastern coast quads or horses are the best way to get around, as roads are scarce. Just google for 'Aruba tours'. You'll find plenty of tour operators. Then check on Cruise Critic's forums for some referrals. Find a beach and work on your tan or try parasailing. Take a taxi - rates are set by the government and are based on destination, not mileage. Or take the bus like we did, it's fun, relaxing, costs about $2.00 round trip and runs about every 20 minutes. Walk off the pier, cross the street and the terminal is just behind the main street, you can't miss it (see on map). Hotel beaches are 20 minutes away. Another one of the great things to do in Aruba... snorkeling. We found by pure luck Boca Catalina/Malmok Beach where the snorkeling was the best off the beach. Once we booked a snorkeling excursion that sailed to the spot of the sunken "Antilla". Aruba is one island I can recommend renting a car. We did and loved it. We had time for sightseeing, snorkeling and even came back to the ship for lunch since we had the jeep for the whole day. Of course, there is also Shopping... I can hear the husbands groan now! It's part of what you need to do in Aruba. It's everywhere as you get out of the cruise terminal and turn right. There are more shops on the side streets, like Haven Street. Look at the downtown map of Aruba. 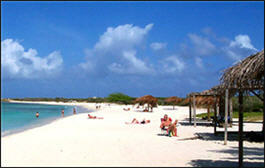 I would like to mention one more thing to do in Aruba: De Palm Island which is a short ferry ride from the mainland. But you cannot buy a ferry ticket by itself. De Palm tours is the only company selling this tour and they won't let you book it directly if you are from a cruise ship, because they have an agreement with the cruise lines. So you have to book the tour through the ship. 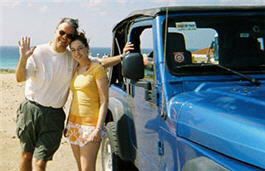 Aruba-Guide.info has many more things to do in Aruba for you - make sure to check them out. They are also a great resource for hotels and accomodation, should you decide to come back for an extended Aruba beach vacation.